77% of U.S. adults said smartphone addiction among children is a problem. Of those respondents, 60% blamed parents, while 10% singled out smartphone makers. As Apple Inc. is under pressure from two major shareholders to take a larger role in combating smartphone addiction among young people, a new survey shows that a majority of U.S. consumers who see kids’ overuse of smartphones as a problem blame the parents, not manufacturers. Seventy-seven percent of adults said smartphone addiction among children is a problem in the United States, according to a Morning Consult poll conducted Jan. 11-16. Sixty percent of those respondents said parents are to blame, compared to 13 percent who pointed the finger at the media and 10 percent who blamed manufacturers. The poll of 2,201 adults has a margin of error of plus or minus 2 percentage points. Of the 642 parents in the poll with a child 17 years old or younger who has a smartphone, tablet, personal computer or a television in their bedroom, 56 percent said parents are to blame for children’s smartphone addiction, compared to 9 percent who blamed the companies who make the phones. That subsection of the poll has a 4 point margin of error. Parents have both the right and the responsibility to monitor their children’s media use, said Dr. Michael Rich, founding director of the Center on Media and Child Health at Boston Children’s Hospital, who contributed research that was used by the Apple shareholders Jana Partners LLC and the California State Teachers’ Retirement System to bolster their argument for the need for more effective parental monitoring tools. As a tech leader, Apple should make it easier for parents to have different levels of control instead of an all-or-nothing approach to technology, Rich said in a Jan. 23 phone interview. The Jan. 6 open letter from the investors says Apple’s parental controls are limited to either completely shutting down or allowing full access to tools and functions, alongside a “dizzying array” of apps if parents want other options, making it difficult for them to choose the right one for their needs. “We’ve got to reframe this discussion, to not a values-based one but an evidence-based one of how we are changed by the media we use, and to make those choices in an informed way — to approach it more like nutrition than religion,” Rich said. That’s why the shareholders, who have partnered with a handful of researchers and social activists, are proposing Apple convene more experts, conduct more research and create more tools and educational opportunities for parents, he said. 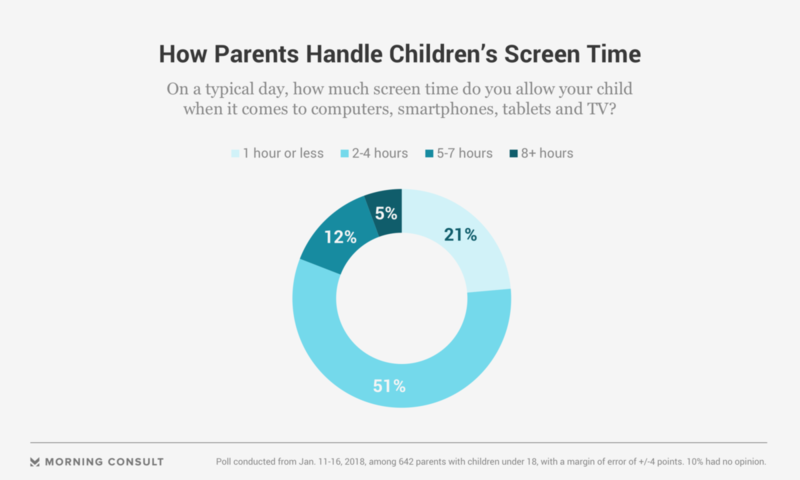 Sixty-nine percent of the parents who allow their children to have a TV in their room or use tech devices said they have already taken steps to limit the amount of screen time their child is allowed. Fifty-one percent said they typically allow their children two to four hours per day with computers, smartphones, tablets and television, while 21 percent said their children get an hour or less of screen time each day. Cracking down on screen time is not necessarily the key to combating smartphone addiction, as school projects and other activities often rely on those devices, said psychologist Mary K. Alvord, director of Alvord, Baker & Associates LLC, who studies resilience in children and adolescents. The key is to give children the tools to deftly navigate the internet and social media to avoid long-term harm to identities or reputations, similar to how parents teach their children to look both ways before they cross the street, Alvord said. Parents, she said, should also build up “real-life” activities to give children incentives to get offline, and watch for indications that their children are developing unhealthy relationships with technology, such as becoming withdrawn or avoiding encountering their peers face-to-face. “There’s so much more positive than there is negative, but as with everything else, you need to place some boundaries on it and get educated with media literacy so you can understand the pitfalls,” Alvord said in a Jan. 23 interview. When reached for comment, a spokeswoman for Apple pointed to the company’s response issued Jan. 8, that listed parental controls, including some that date back to 2008, a year after the iPhone debuted. Clarification: This story was updated to clarify the group of respondents who blamed parents for children’s smartphone addiction.